Germany's chances of a Euro 2004 quarterfinal spot were hit hard as they were held to a dismal 0-0 draw by debutants Latvia on Saturday. Latvia, who came close to victory in their opening 1-2 defeat by the Czech Republic, put up another competitive display to earn their first point in a major tournament, prompting rapturous celebrations by their players after the final whistle. The Czech Republic were the first team to reach the quarter-finals at Euro 2004 after winning one of the all-time classic European Championship matches 3-2 against the Netherlands on Saturday. The hopes of the Portuguese nation rest on an outright victory by Luiz Felipe Scolari’s team tomorrow night against Spain. Otto Rehhagel’s Greece are just one point away from reaching the quarter-finals of the 2004 European championships for the first time in their history. Champions France are drawing comfort from the struggles of their main Euro 2004 rivals after squandering the chance to qualify early for the quarter-finals. Coach Jacques Santini played down his disappointment following the 2-2 draw against Croatia, stressing that no side had yet reached the knock-out stage after only two games. 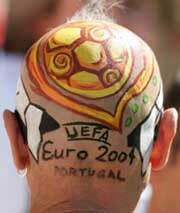 A German supporter with his head painted before the Group D match between Latvia and Germany at Porto's Bessa stadium on Saturday. 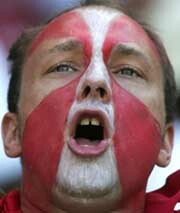 A supporter of Latvia shouts during their Group D match against Germany at Porto's Bessa stadium on Saturday. The match ended in a goalless draw. 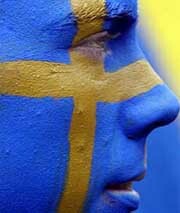 A supporter of Sweden watches the Group C match between Italy and Sweden at Porto's Dragao stadium on Friday. A late strike by Zlatan Ibrahimovic gave Sweden a battling 1-1 draw. Lisbon: England striker Wayne Rooney has been allowed to keep his second goal against Switzerland after UEFA investigated on Friday whether it should be credited as an own goal for Swiss keeper Jorg Stiel. Having doubled up as a wicketkeeper for close to two years, vice-captain Rahul Dravid today said it was time that India considered a specialist like Parthiv Patel for the job in one-dayers as well, keeping the future in mind. World number one and top seed Roger Federer opens the defence of his Wimbledon title here on Monday determined to play down expectations that he has the game and grace to emulate legendary seven-time winner Pete Sampras. Member of India’s World Cup 2003 squad Dinesh Mongia had a quiet start for his county Lancashire as Warwickshire batsmen, especially Mark Waugh, made merry in the Frizzel County Championship Division One match at Straford-upon-Avon. Suspended Italian striker Franceso Totti (front right) sits in the stands with his girlfriend Ilary Blasi before the Group C first round match between Italy and Sweden at Porto's Drago stadium on Friday. Totti received a three-match suspension for spitting at a Danish player in Italy's earlier match. Germany will be eliminated if they cannot beat the Czechs in their last group D game after failing to repeat their convincing performance in the opening 1-1 draw with the Netherlands. The 2002 World Cup finalists are at risk of another early exit from the European Championship after failing to survive the group stage four years ago. The Baltic debutants looked well organised and resisted Germany in a tight, tactical first half of few highlights. The second half was more one-sided, Germany stepping up a gear but looking clumsy in front of goal and failing to breach a determined Latvian defence. Latvia right back Aleksandrs Isakovs received the fastest yellow card of the tournament when he clattered midfielder Torsten Frings a few seconds into the game. The opening skirmishes were tense and dull with no clear chance until Frings fired over the bar from outside the box on eight minutes. Germany threatened again when striker Kevin Kuranyi controlled the ball on his chest and shot narrowly wide but there was little to get excited about for the German fans. Germany, playing with two strikers, failed to put their opponents under real pressure and were far less convincing than against the Netherlands. However, they showed more initiative with the break approaching, midfielder Michael Ballack and Kuranyi firing in shots. Latvia fought bravely and threatened shortly before half time when striker Maris Verpakovskis surged powerfully into the box and produced a good save from goalkeeper Oliver Kahn. There was another pacey run from Verpakovskis 10 minutes into the second half which ended when he was sandwiched by two defenders but his appeal for a penalty was harshly turned down by English referee Mike Riley. Germany appeared to need a set piece to break the deadlock and came close in the 64th minute when Latvia goalkeeper Aleksandrs Kolinko did well to punch away a fierce Ballack free kick. The Czechs came back from two goals down to win a group D game full of exhilarating play when Vladimir Smicer tucked home the winner in the 88th minute to break Dutch hearts. The Dutch finished with 10 men after Johnny Heitinga was sent off. The two former winners produced a series of high speed enterprising moves as they both sought the victory that would put them on course for the quarterfinals after Germany were held to a goal-less draw by Latvia earlier in the day. The Dutch went 2-0 up with goals by Wilfred Bouma and Ruud van Nistelrooy before Jan Koller pulled one back to make it 2-1 at the break. Both sides made countless further chances, the Dutch twice hitting the woodwork, before Milan Baros earned the Czechs a deserved point with a thunderous equaliser in the 71st minute. The Dutch played out the last 20 minutes with 10 men after a second yellow card for defender Johnny Heitinga but the Czechs could not take advantage. The result puts the Czechs through with six points. Germany have two and the Netherlands and Latvia one. Germany play the Czech Republic and Latvia face the Netherlands in the final games next Wednesday. The Dutch army of orange-clad fans making up the majority of the 30,000 crowd had barely finished cheering Latvia's draw with Germany when they were on their feet again at the start of what would prove 90 minutes of exhilarating football. Jan Koller had blasted a close-range volley over the bar after less than two minutes but in the fourth Dutch defender Wilfred Bouma was left totally unmarked at the far post to head in Arjen Robben's right wing free kick. Clarence Seedorf, recalled after missing the 1-1 draw with Germany through injury, then grazed the post with a free kick before Ruud Van Nistelrooy made it 2-0 in the 19th minute, sweeping in Robben's low cross from the left having been left alone as he initially jogged back from an offside position. The Czechs, knowing a win would clinch a place in the last eight, replied four minutes later after Dutch captain Philip Cocu gave the ball away to Milan Baros in the centre circle. Baros charged towards goal, broke through Jaap Stam's tackle and rolled the ball into the path of Koller to tap in from close range. The Czechs continued to probe, playing some excellent football but finding the Stam-inspired Dutch defence on the top of their game. The Dutch stormed back, with Johnny Heitinga and Seedorf both flashing long range shots just wide before Davids ended the half by rattling the post with another. The second half picked up where the first had finished, the opening two minutes producing good chances at both ends, which Dutch keeper Edwin van der Sar and his Czech counterpart Petr Cech both did well to foil. The keeper was powerless in the 71st minute, however, as Koller chested a long pass into the path of Baros, who slammed the ball home from the edge of the box. Cech saved brilliantly from Andy van der Meyde a minute later and Van der Sar matched him with a double stop in the 75th, moments after Johnny Heitinga was sent off for his second yellow card. The hopes of the Portuguese nation rest on an outright victory by Luiz Felipe Scolari’s team tomorrow night against Spain. The European Championship hosts must claim three points to avoid the fate of Euro 2000 co-hosts Belgium as the only host nations not to reach at least the quarter-finals of the world’s most prestigious continental event. History is not on their side, as Portugal have not defeated their Iberian neighbours since 1981, and they have never won in five competitive matches with the 1964 European Champions. Spain, who have four points in Group A to Portugals three, are also under pressure to get a result, as they must avoid defeat at the capital’s Alvalade Stadium to reach the last eight — unless Greece lose to Russia by a greater margin in the day’s other contest. With all to play for then in the sure-to-be tense contest, both sides are at least publicly dismissing historical concerns and focusing squarely on the task at hand. Saez is of the opinion that his team’s 3-0 friendly win over Portugal in Guimaraes last September is all-but meaningless. “I will look at the game of course, and so will Scolari,” said the 61-year-old boss. “The line-ups may be similar, so it will serve as some kind of reference, but the games themselves will be completely different. Knowing that they need to avoid losing has the Spaniards talking confidently ahead of the do-or-die clash. Portugal’s silky defensive midfielder Costinha saw things from a different angle naturally. Otto Rehhagel’s Greece are just one point away from reaching the quarter-finals of the 2004 European championships for the first time in their history. Greece play Russia here tomorrow in the final Group A match and require a draw to progress into the last eight and leave Iberian duo Portugal and Spain to battle it out for the right to join them. It would mark a real turnaround in fortunes for Greece who had not won a match in a major finals before their shock 2-1 triumph over hosts Portugal on the opening day. Rehhagel, known as ‘King Otto’ after winning two German championships, two German Cups and UEFA Cup with Werder Bremen in a 14 year reign, can expect royal treatment when he returns to Athens if his side can finish the job. It would also help Greek fans to forget the 1994 World Cup nightmare when they lost all three matches in the USA. The Greek Prime Minister has already invited the German manager for a cup of coffee after the competition but that could stretch to champagne if Greece continue their progress. Russia picked up the unwanted accolade of becoming the first team to exit Euro 2004 but vowed not to lie down for a third successive defeat. “Those who think we will just stroll around in this match are mistaken,” warned coach Georgy Yartsev. One ardent fan is Chelsea’s Russian billionaire owner Roman Abramovich who will no doubt be dismayed that his wide cheque book cannot help infuse new talent into the side to help them try and score in Portugal. Personnel problems plague Russia with captain Alexei Smertin and goalkeeper Sergei Ovchinnikov both suspended, though Roman Sharonov should return after serving a one-match suspension following his sending off in the opening 1-0 defeat by Spain. Meanwhile, Greece must do without Bolton midfielder Stylianos Giannakopoulos through injury and Georgios Karagounis who is suspended. Champions France are drawing comfort from the struggles of their main Euro 2004 rivals after squandering the chance to qualify early for the quarter-finals. Coach Jacques Santini played down his disappointment following the 2-2 draw against Croatia, stressing that no side had yet reached the knock-out stage after only two games. Italy are facing early elimination after drawing their opening two matches against Denmark and Sweden, while Spain, Portugal, Germany, the Netherlands and England are also battling to seal places in the last eight. The holders seemed on course to book their spot when they went ahead in the first half against Croatia but they took their opponents too lightly after the interval and had to come from behind to avoid defeat. ''Of course, we were disappointed because we were planning to rest some of our players for the third match,'' Santini said. ''But there is no reason to get worried. We came here to play six matches. We are still in the race. The result confirmed that this tournament is going to be very tough. Only the Czech Republic can still make it to the next round after two matches if they overcome the Netherlands in Aveiro on Saturday. The French, last-gasp 2-1 winners over England in their opening match, still need a point against Switzerland on Monday to reach the quarter-finals. ''The tournament is tougher than we expected,'' said striker David Trezeguet. ''The Spaniards and the Italians are not in a better situation than we are. Italy will be knocked out regardless of what happens in their final match against Bulgaria if Sweden and Denmark draw 2-2, England need a point against Croatia, and in Group D the Dutch, Germans and Czechs are chasing two spots. Rooney’s close-range header gave England the lead in Group B clash and made him the youngest player ever to score in a European Championships but his second-half shot hit the post and rebounded off Stiel into the net. 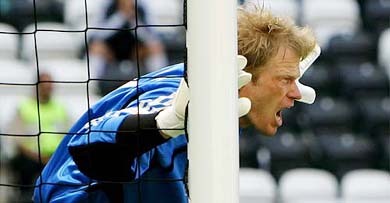 Berlin: Latvia’s ambassador to Berlin has offered Germany goalkeeper Oliver Kahn honorary Latvian citizenship if he makes a blunder that helps the underdogs in their Euro 2004 match on Saturday. Dravid, who has often expressed his reluctance to don the keeping gloves, said he considered wicketkeeping a challenge because he was "not a natural wicketkeeper". "Parthiv's performance is a great sign for India. I hope that he will be given the opportunities to become a full-fledged wicketkeeper-batsman that India probably needs in the future," Dravid told reporters on the concluding day of the training camp for Asia Cup probables here. Dravid's views come barely a week after skipper Sourav Ganguly's comment that he would have to continue with the vice-captain doubling up as keeper as it helped the team in terms of balance and batting depth. "If you can find somebody who can do the job as good as Dravid has done in the past two years for the team, then we might start thinking. But at the moment, he is doing such a wonderful job, we will have to stick with him," Ganguly had said here on Sunday. Ever since Federer finally converted raw potential into historic silverware at the All-England Club last year, comparisons have been made with the American who serve-and-volleyed his way to 14 Grand Slam titles before calling it quits last year. “I’m maybe the most natural ball-striker, but just for me, my game feels natural,” said the Swiss 22-year-old who has since added the Australian Open and Masters Cup to take his career singles titles tally to 17. Federer, who opens his Wimbledon campaign against British wildcard Alex Bogdanovic, has the grace and elegance on court which has spectators, exhausted by the slam-bang of the world’s baseliners, swooning. After years of knocking on the door, last year’s 7-6 (7/5), 6-2, 6-4 final triumph over mark Philippoussis came as a relief. “I proved it to everybody,” Federer said. “It was a big relief because there was pressure from all the sides and also from myself. 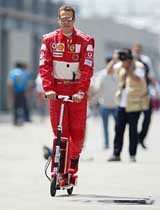 “In the end when I held the trophy up it was very tough with the emotions. “It took me a long time because I was rather crazy when I was young,” added Federer who has built up a 17-match winning run on grass stretching back to his shock first round defeat to Croatia’s Mario Ancic in 2001. “I was using too much energy with all the negative thoughts and all of it would make me very tired at the end of a tournament. I would get to the quarters or the semis and I was very tired already and I couldn’t imagine myself playing two or three weeks in a row. Federer, however, has his work cut out if he is to feel really at home in the pantheon of the greats. Sampras was a seven-time winner, Bjorn Borg five while John McEnroe and Boris Becker lifted the famous trophy on three occasions. This year, he is seeded to face US Open winner Andy Roddick in the final with the American 21-year-old fresh from a successful defence of his Queen’s Club where he fired down more world record setting service howitzers. “I felt I was playing really good tennis last year,” said Roddick who has former Andre Agassi coach, Brad Gilbert in his corner. Roddick was beaten in the semi-finals by Federer last year but was in awesome form at Queen’s where he set a new record for ther world’s fastest serve timed at 246.2 kph. Roddick, who faces Taiwan qualifier Yeu-Tzuoo Wang in his opener, also put out 2002 Wimbledon champion and triple Queen’s champion Lleyton Hewitt in the semi-finals. “I don’t try for the record serves, they just happen,” said the American. Britain’s Tim Henman, four times a semi-finalist and seeded five this year, could be the biggest threat to a Federer-Roddick showdown on July 4 as he tries to become the first home men’s winner since Fred Perry in 1936. “At this time of year, there are so many opinions out there and the fact is there is very few I am worried about or interested in,” said the 29-year-old Henman. Henman, who could run into Philippoussis in the fourth round, became the first British man in 41 years to reach the last four of the French Open last month but then had a disastrous opening to his grass court season losing to Karol Beck of Slovakia in the first round at Queen’s. With Andre Agassi, the 1992 winner, not playing because of a hip injury, the crowd’s sympathy vote will be with Goran Ivanisevic who won in 2001 but has been unable to return since because of a series of injuries. The Croatian opens up against Mikhail Youzhny of Russia. Whatever happens, the tournament will be the end of the road for Ivanisevic. Choosing to bat first at a place known for Shakespeare and not cricket, Warwickshire had a brilliant start yesterday with former Australia opener Mark Waugh (167) and captain Nick Knight (53) giving them their third century-partnership in a row. In the middle order, Jonathan Trott hit a crafty 54 while Bradley Hogg (56) also completed his half century. At the end of the day, Warwickshire were 495 for nine wickets in 104 overs. Handed over the ball, Mongia got the wicket of D.R. Brown when he caught the latter plumb in front of the wicket with the batsman on 16. The Indian returned with a figure of 17-1-82-1.